So, we met. He’s young. Tall. Slim. Thoughtful. Clever. Gentle. What more could you want? And he’s brave. I’ve written to Stern’s music suggesting they sell his music. They should. People would buy it, and like it. It’s good. Good tunes, and good words. Really, very good. I’ve listened to the whole album, Nutrição Espiritual, and liked it all, but a few really stood out. The last bonus track – Duas faces da mesma moeda – is a brilliant argument about socialism and capitalism. One voice shouting out all the awfulness that has happened under socialism here, taking Castro down with him; the other voice shouting down the ghastliness of capitalism, the wild brutal greed. It’s quick, engaging and so bloody true. I’m sorry to bring things down, but I found myself giggling hysterically the second time I heard it, reflecting on a truly awful debate I heard in Cambridge (yes, the university) with students – did someone say they’re the *best* in the world? – discussing economics. It was appalling. Dreadful. Ignorant. Shameful. And here I am, in Luanda, listening to a young rapper, taking the ideologies to pieces, dissecting theory and fact superbly, quickly, swiftly and, heck, musically. Fesa is ten years old. Fesa is a factor of social development. Fesa says: Bread can kill hunger. Water can quench thirst. But only solidarity can nourish hope. And hope, says Fesa, is what Angola needs. For ten years Fesa has been working to give encouragement to those who most need it. Solidarity: this is what Angola needs. Happy birthday. This is what I read in Jornal de Angola last night. A double-page spread. A hand cupping an orange. A pair of hands reaching out or had they just thrown the orange into the cupped hand? All in the eye of the orange-holder. Fesa has a Swoosh – or is it a Swish? – a bit like the Nike one, except that it’s a double almost treble Swoosh. Other interpretations of Fesa have been made, in particular and perhaps most eloquently, by the late Christine Messiant. I’ve just finished reading Joan Didion’s Salvador, which disappointed. It was based on a two-week trip to El Salvador in 1982 at “the height of the terrible civil war [she] travels from battlefields to body dumps”. There must be something wrong with me for not admiring this work enough. The New York Times said: “It is quite impossible to deny the artistic brilliance of her reportage.” The Sunday Telegraph said: “A writer of haunting power and global vision who sees a world on the edge of a nervous breakdown and is not afraid to deliver the news.” Crikey. I said: “A very good writer who spent too much time in the company of the US embassy and not enough time with the Salvadoreans.” Oh dear. Am I suffering from myopia? I must have missed the point somewhere. She writes much of terror and how she came to understand terror. Maybe this is the difficulty: reading this in 2007, in a world where we are warned of terror as if it were a pothole we might fall down at any minute in the dark. You can buy seatbelts to help avoid terror, by the way. Back on Didion: she is, says The Times, “one of America’s finest literary stylists, most penetrating reporters and acutest critics”. I’m probably just jealous. Of Didion and Fesa. I’d love to be ten again. Nothing is stranger than strangers who move to a new country and never learn the language. A French woman, a very nice woman indeed, has been living here for (let me just say) many years and speaks barely a single word of Portuguese. What does she do? Who does she talk to? How does she move around the city? Do the shopping? Speak to the traffic cops? I asked her, vous aimez Angola? Oh yes, she said, I love it. I much prefer living here to France. She had an enviable take on the pulse of the country too. The people are getting fed up, she said, fed up with being so poor while everyone else is getting richer. They are angry, she said, it can’t stay like this forever. They are going to get more and more angry. Perhaps you don’t need to speak a language to feel the rhythm of a place. Perhaps you don’t need to be able to communicate verbally. You only need to look in the eyes of the povo*, said an Angolan man, to tell that they are angry. I’ve heard it said, often, in the last few days, that the elite here are too scared to have eye contact with the povo. If a politician, for example, is driving home in the evening, and he is caught in a traffic jam, and finds himself next to a kandongueiro stop with ten or twenty people waiting to travel home, he will not look sideways at them, or nod, or acknowledge even their presence from behind the comfort of his window vacuum. He is scared. He doesn’t want to see the hatred in their eyes, the anger, the laughing. The balance is tipping, such that even a foreign lady who rarely ventures beyond her high security gates, can feel something is on the move. Something is changing. Do we need to speak to each other to know these things? Or is observation more valuable? Thinking this I remember a very good film made by a very good film-maker. Two hours in the desert with a Touareg family. For much of the time they were speaking in languages only another Touareg would follow: a mix of Tamashek, occasional Arabic (though of course, there are many forms of Arabic) and bits of French. The film-maker offered no narration and only subtitled certain bits of conversation, leaving a lot of the communication between people to be observed, if not directly understood. This caused great consternation for some audience members. One woman seemed to think it showed that the film-maker had discriminated against the Touareg: if he respected them as equals he would have translated every single word which left their mouths. Really? When we visit foreign lands, often we do not understand what people are saying. At the beginning we get by with simple nods and gestures, and trusting people to lead us. Why should a film-maker help the audience to leap-frog this stage? More important though, is the idea that words matter so much. You don’t need to understand everything someone is saying to read their emotions. Words are often unimportant. After I have interviewed an individual, and listened meticulously to every single word they have said, sometimes, a few hours later, I am left trying to remember what they looked like, how they smelt, whether they stuttered, whether they looked me in the eye when they were talking. Now, I take a tape recorder and record everything, and all that I write is what they are doing and how they are speaking. That way I get the whole picture. * povo means people, but here, in Angola, it means more than people. It means, the mass, the poor majority, and for some, even still today, the lumpen. Trying to explain this word to me recently, a friend, a man, said, ‘We call the people povo because we see them as a block, and, like children, we group them together as a like-minded, same-thinking mass who are in many ways quite childish.’ I am still pondering his thoughts. 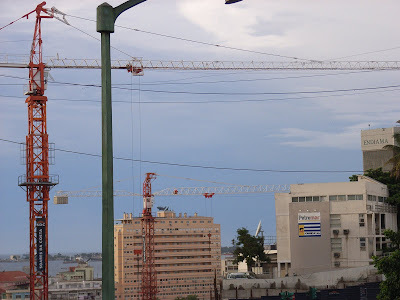 A reader of this blog suggested I add some pictures of new buildings in Luanda to balance out those of Sambizanga, and show people the ‘other side’ of this (partially) changing city. So I have. But before you look at these pictures, think about this a little. 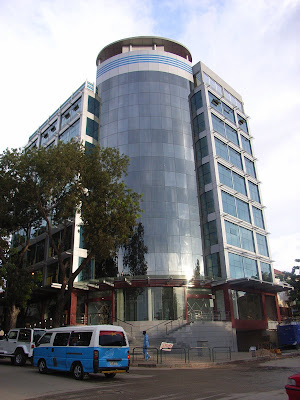 I would love to take lots of pictures of the new buildings in Luanda. Some, I think, are incredibly impressive. Some are even verging on stunning. Some are plain ugly. But that is neither here nor there if the only aim is to record their existence and record change. Taking pictures here is very difficult. The other day a friend of mine, an Angolan woman, was stopped by police for taking pictures of some older buildings in downtown Luanda. In the end, the only way she managed to keep her camera and the photos was when her aunt turned up and paid the coppers $50. Another friend of mine – a while back – was taken to the police station for taking snaps in Luanda. He wasn’t snapping the palace, or the police, or the presidential guard – just a hotel (a rather ugly one at that). In contrast to this, if you go into places like Sambizanga, people leave you to click away. You won’t be arrested or bribed. OK, you might be mugged, but this might happen in any city when you’re carrying a camera so it’s hardy peculiar to Luanda. If the authorities here really want people to see the good side of things here, they should allow us to examine them in our own way, and snap them too. Unfortunately, and particularly if you are foreign (like me), you are much more likely to be accused of spying. Flattering, maybe, but incorrect. Anyway, enough of that. Here are some pictures. This building is very close to where I live. It was built by Angolans and Chinese. Unlike the employees of Casais (the brutal Portuguese company who tried to destroy our house), the men who built this building were provided with hard hats and boots. That blue and white vehicle below is known as a kandongueiro and is what most Angolans rely on for transport. It costs 50 kwanzas a hop, more or less. That’s about 70 cents. They can be a wee bit hairy but on the whole – inside the city – they are pretty reliable (a lot more so than your average London bus). But you need bendy legs and a hard arse if you’re going a long way. Always guaranteed good conversation (again, a lot more so than your average London bus). Just to come back to Casais again: they are destroying another building on the Marginale. Just like the exploited employees they have doing work next door to us, their men on the Marginale do not wear boots and protective helmets. They work in dangerous conditions with no protection. Does anyone think Casais would be allowed to get away with this in Portugal? Cranes are everywhere. From my bedroom window, I can see four huge cranes. Building building building. This is one of the cranes I can see. It’s helping to build a(nother) hotel. When I lived here before in 1999/2000, street kids used to sniff petrol on this very same spot. Not any more they don’t. Now they go around the corner, just up the road from the Hugo Boss shop. ‘Men here spend more money on clothes because they are more vain than women and they have all the money.’ That’s what I was told. Who knows if it’s true. Finally, look at this. Can you see? Yup. That’s Nike. Nike goes artisan goes global. I couldn’t resist buying it. It cost about $3. It’s brilliant. ‘My uncle makes them,’ said the young man who sold it to me. I’m not sure I believe him. But whoever is making them is very clever. How did Nike come up with that horrible tick? And why do people love it so much? Beyond the inner tarmac circle, this is what the roads of Luanda look like almost everywhere. As we left Sambizanga, a lady caught me taking this picture, and she roared with laughter and shouted to the man I was with: ‘Don’t let those tourists take shots of our lakes of Sambizanga!’ And then she laughed even more. They are lakes, and I feel deeply ashamed that when I first got here I said that people don’t need four by fours. They do. But the truth is, the people who have them – the rich and the foreign – don’t actually enter these areas that much. The people who need them are the poor and the local who live here and must cross the lakes every day. This is a good business: giving piggy-backs across the lakes. We sat in a bar around the corner from here and drank bottled Coke for 60 kwanza, a quarter the price of Belas Shopping. An old man muttered sweet somethings to himself and other men stared. Then we all got talking. I won’t tell you about what. That’s a secret and if you’re interested, wait for my book. I will tell you one thing though: the people who live in places like this are a whole lot more open and chatty than the wealthy. ‘What do we have to lose? We have nothing! What do we have to lose talking to you? Of course you can use my name. Say what you like. It’s time they were told the truth.’ I am feeling very humbled. It’s all in the mind. Except it’s not. It’s very real. It’s all about what might happen. And it’s better to avoid finding out. Just in case. It’s all about control through the possibility of what might occur. Even if it won’t and couldn’t. Because it always could. It’s all about where you are, but that’s only your body. Are you really there? Of course you are. But it’s not about your body, your physicality; it’s what you’re doing. No. It’s not about that either. It’s about what you might say. No. It’s not about that. It’s about what you’re thinking. Or what you might think. Worse, what you might share in thought. Keep your thoughts to yourself. That’s the best advice I can give. Don’t even think those thoughts. Best of all, don’t have thoughts. Just embrace the day. Embrace the beach. Embrace the sun. Embrace. But don’t embrace your thoughts. Hilarious. Hilarity. Hysteria. Hysterical. No. No. No. It’s all very calm. Everything’s under control. Nothing strange is going on. It’s getting better. Just stop thinking. I’m just walking down the street. I’m just sitting at the table. I’m just going to the beach. I’m just going for a coffee. I’m going to bed. I’m smoking. No. Don’t smoke. I’m just having a drink. Just a drop, with my coffee. I always have a drop. My father did. My grandfather did. Just a drop. My mother does. Just a drop. It’s all in the mind. Not that the whisky makes it go away. It makes it worse. But it’s not real. I know that. I need to concentrate. I need to settle down. I need to find stability. I need to grow up. I need to embrace the now. Now. This is the world we live in. I can go there and look away, but it is the world I live in. It’s really better if you stop now. Just for a bit. Get things on track. That’s what we’re all doing. Getting things on track. No one minds if you do that. We don’t mind. We’ll leave you alone. You’re free to do that. Free. There is no control. You just need to get to work. Get busy. The trouble is I’ve got too much time to think. That must be it. And I know I’m not supposed to think. It’s all in my mind. My mind. I need to be busier. Busy. Busy filling my thoughts. It’s hard work. Discipline, self-discipline, that’s what I need. When I think, I must learn to discipline myself. No one else can do it for me. I must be in charge of my own thoughts. I must be responsible for myself, for my well-being. That is the truth. Perhaps objective journalism should ponder this. Instead of reflecting the different points of view – for example, the government, the opposition, the diplomats, the business interests, the people (is that Freudian that the people are last on that list?) – in a story and allowing each side a slice of the story, should we, instead, not divide our reports up in terms of relative percentages. So the people would get 95% of the space, and all the other groups would get a lot less. A story of 1000 words would have to give 950 to the views of the people. This might start to rebalance the glaring partiality of news all over the world. News tends to focus on business and politicians, or politicians and business, a highly unrepresentative group of people. OK, we are all told that we live in democracies and these politicians represent us, but of course, they don’t. They certainly don’t in countries where there haven’t been elections for many, many years; and they certainly don’t in countries where few people can be bothered to vote. We all know that. So why is it that journalists – myself included – spend so much time interviewing politicians? They can be fun to interview. But they can also be incredibly boring. People, on the other hand, are rarely dull. Very very rarely dull. Journalistic objectivity is highly undemocratic. We divvy up space and seconds in terms of group membership, not group size. Money and power determine space, not numbers. Highly subjective. If I apply this to my own work, here in Angola, I should be spending at least a third of my time interviewing people in the slum areas in the capital, Luanda; half of my time should be spent outside of Luanda talking to members of the public in the other 17 provinces; and the rest of my time (is there any?) should be devoted to political and business leaders. Once a year, I could interview a diplomat! Seen from an economist’s perspective, this is no doubt a flawed proposal. My time should be divided up in terms of relative economic power. So I’d have to spend the vast bulk of my waking hours with oil companies, the foreign and domestic business elite, politicians, construction and diamond companies. Once every so often, I could have a chat with a small farmer, a lady at the market and a hawker. I don’t know how much more time I’ve got here. My visa is running out. Certainly, I’ll have to leave by the end of the month. Perhaps I should dedicate as much of that time as I can to the people who live in the slums of Luanda. I will try to leave the capital too (believe me I’ve been trying, but it’s a long story about a visa and a receipt and a plan ticket to Luena), and remind myself that Angola is not Luanda.